Over the past two decades mobile infrastructure has attracted the lion’s share of investment in Africa’s fast growing telecoms markets, but fixed infrastructure is seen as increasingly important. “Using other parties’ infrastructure is very costly to telecom operators so investing in your own network is critical to meet the customers growing demand for data,” the banker added. Senior executives from Africa’s leading telecom, media and technology companies, private equity investors, investment bankers and advisers will meet to discuss the latest Investment opportunities at the annual TMT Finance Africa Conference in London on June 14. Broadband investment is a key topic for debate with key speakers from Vodafone, Google, Millicom, Fibersat, PCCW, WIOCC, SEACOM, Avanti Communications, Convergence Partners, IHS, Helios Towers Africa, Eaton Towers, IFC, Every1Mobile, TransferTo, Goldman Sachs, Icolo, Bima, Citi, UBS, GDV, Access Bank, Connect Africa, Standard Bank, Nokia, Credit Suisse, and others. 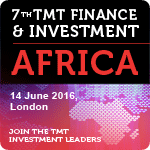 TMT Finance & Investment Africa 2016 is a senior executive networking event bringing together key telecom, media and technology industry decision makers, investors, financiers and advisers. The 2016 programme features 20 sessions with no media to ensure confidentiality. TMT Finance is the leading news and events provider for telecom, media and tech executives active in mergers and acquisitions, financing strategy and investment globally.